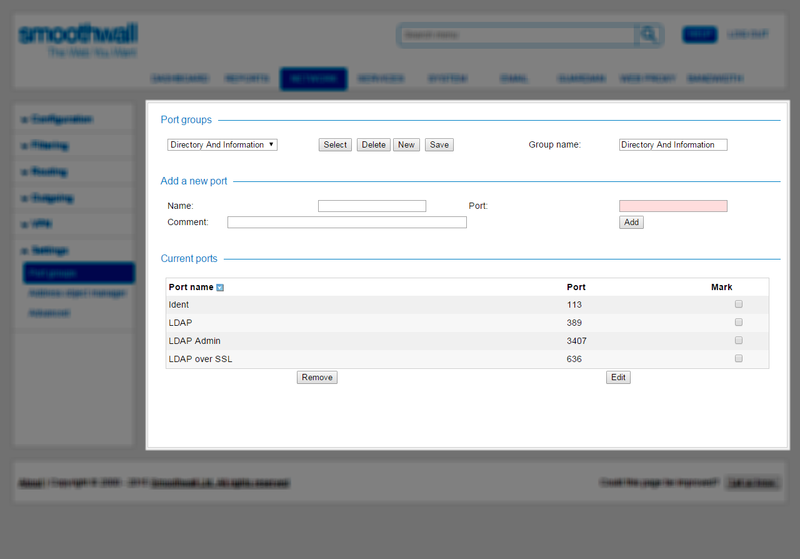 You can create and edit named groups of TCP/UDP ports for use throughout the Smoothwall System. Creating port groups significantly reduces the number of rules needed and makes rules more flexible. A port group contains a number of named ports, port ranges, or both. For example, you can create a port group to make a single port forward to multiple ports and modify which ports are in the group without having to recreate the rules that use it. In this way you could easily add a new service to all your DMZ servers. 1. Go to Network > Settings > Port groups. 2. In the Port groups panel, click New. 3. Configure a meaningful name for the port group in the Group name box. 5. From the Port groups drop-down list, select the new group, and click Select. • Name — Configure a meaningful name for this port, or range of ports for the group. • Port — Enter the port number or numbers. For one port, enter the number. For a range, enter the start and end numbers, separated by, for example, 1024:65535. For non-consecutive ports, create a separate entry for each port number. • Comment — Optionally, configure a description for this port range. 8. Repeat for additional ports and port ranges for this port group. 2. From the Port groups drop-down list, select the group you want to edit and click Select. • Select the port you want to change from the Current ports panel, and click Edit. Update the port settings in the Add a new port panel. • In the Add a new port panel, configure a new port, or port range. For a detailed description of each setting, see Creating a Port Group. 3. From the Current ports panel, highlight the relevant port or port range. 2. From the Port groups drop-down list, select the group you want to delete and click Select. Note: Deleting a port group cannot be undone.